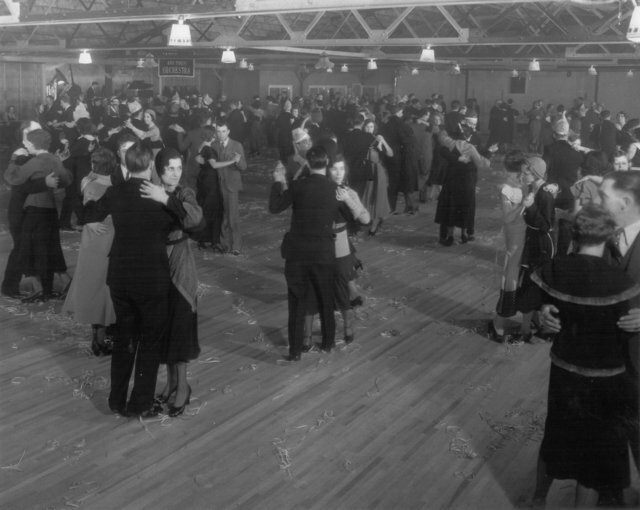 There was a time when THE hottest place to be for New Year’s Eve was at one of Iowa’s ballrooms, which could be found across the state in cities, small towns and even in the country. While most of these iconic places are gone, Lake Robbins south of Woodward carries on a proud Dallas County tradition since 1931. Ringing in the New Year. The legendary Lake Robbins Ballroom opened Nov. 11, 1931, and soon became one of the hottest entertainment venues in Dallas County. 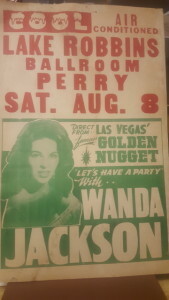 With its 10,000-square-foot white oak dance floor (which is still in place), spacious interior and music from popular dance bands of the day, the ballroom became a destination. 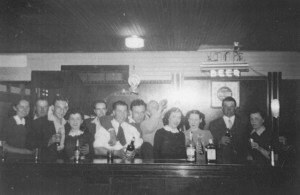 The photo at the top of this blog post which shows people dancing was likely taken on New Year’s Eve, circa 1933. Notice what appears to be confetti on the dance floor. The beginnings of Lake Robbins. Located southwest of Woodward, Lake Robbins started as a natural pond. In the 1920s, Riley Robbins and his son, Mervin, built a man-made lake dredged out by teams of horses. 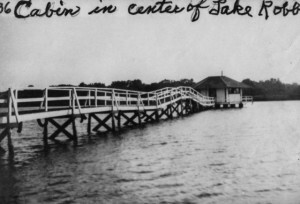 Robbins built an eight-sided cabin with a boardwalk to the edge of the area that would become the famous Lake Robbins Ballroom. A drought in 1936 decimated the lake, which was not rebuilt. One of Iowa’s last ballrooms. Lake Robbins has always been in the country, and there’s only one way to get there—an unpaved country road. While the ballroom has always had a simple exterior, the magic occurs inside. Through the years, countless married couples first met at Lake Robbins. While many Iowa towns used to have ballrooms, Lake Robbins is one of the few that remains. Soon-to-be-married dance champions. 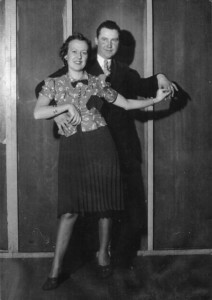 While they were not yet married when this photo was taken in 1938, Jacob Cushing of Adel and his future bride, Florence, won a dance contest at Lake Robbins Ballroom. The event was sponsored by Chaplin Gas & Oil. This photo was taken by Edmondson Studio in Perry. Celebrating the good times. 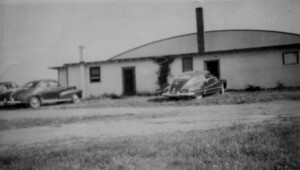 Young people from Dallas County and beyond flocked to Lake Robbins Ballroom, which was one of the few places in the country that had electricity in the early 1930s. Some say future president Ronald “Dutch” Reagan patronized the ballroom when he was a broadcaster at WHO Radio in Des Moines. Lake Robbins was inducted into the Iowa Rock & Roll Music Association in 2007. Kip Shannon’s 80+-year career. While she didn’t work on the opening night (Nov. 11, 1931), 23-year-old Coloma “Kip” Shannon stopped by the new Lake Robbins Balloom with her family. 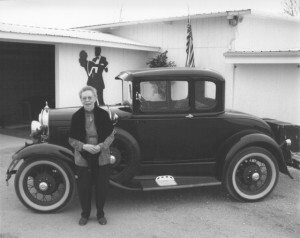 She got a job selling tickets there soon after and also handled practically every job at the ballroom during her career, which spanned nearly 80 years at Lake Robbins. Kip died at age 105 in 2014. Today, owner Lyn Wilkinson carries on the Lake Robbins Ballroom Iowa legacy, caring for the beloved ballroom that she has owned since 1993. Stop by this remarkable venue for an evening of music, dancing and an unforgettable piece of Iowa history. Want more Iowa culture and history? Lake Robbins Ballroom will be featured in my upcoming book, Dallas County, a pictorial history from Arcadia Publishing, which will be released in the summer of 2017. In the meantime, check out my top-selling “Calhoun County” book, which showcases the history of small-town and rural Iowa, as well as my “Culinary History of Iowa” book from The History Press. Order your signed copy today!